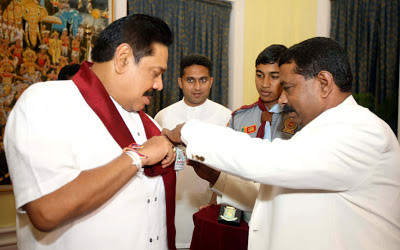 Today(3rd December 2012) Officials of RISGO Centennial 2013 met the Chief Scout, His Excellency Mahinda Rajapakse, President of Democratic Socialist Republic of Sri Lanka and presented the first Jamboree Scarf and the Badge. The meeting was held at the Raja Medura (official President's House in Kandy) on 3rd December 2012, with the participation of RISGO chief S.M. Keerthirathna, Co-President Mr. Sarath Matharaarachchi and all the top officials of RISGO and 1st Kandy Dharmaraja Scout group members. During the meeting, RISGO officials explained the background of Dharmaraja Scouting and the concept behind the event RISGO. Also RISGO officials invited His Excellency President to be the chief guest at the event. The chief scout, His Excellency President expressed his well wishes and express fullest support to the event.